Bat Conservation International has released a map (above) showing the current distribution of White-Nose Syndrome (WNS), which appears to be devastating New England colonial bat populations. The disease has now spread into 12 states, and north into Quebec and Ontario. It's crept west to Missouri and south to Tennessee, where it has been confirmed at a cave in Great Smoky Mountain National Park that hosts the state's largest colony of endangered Indiana Bats (Myotis sodalis), a species of special vulnerability, since 85% of its known population hibernates in just 7 caves. In February 2006, bats in a hibernaculum near Albany, New York were found with a crust of white fungus on their face and wings. The fungus was originally identified as belonging to the genus Fusarium, a group primarily associated with plant disease, but including vertebrate pathogens as well. At the height of the Cold War, both the U.S. and Soviet Union conducted biological warfare research with Fusarium fungi. In 2008, it was determined to belong to another fungal family altogether, and was ascribed to the genus Geomyces. Last year, it was identified as a new species: G. destructans. By February of '07, several infected hibernacula were identified in the area. 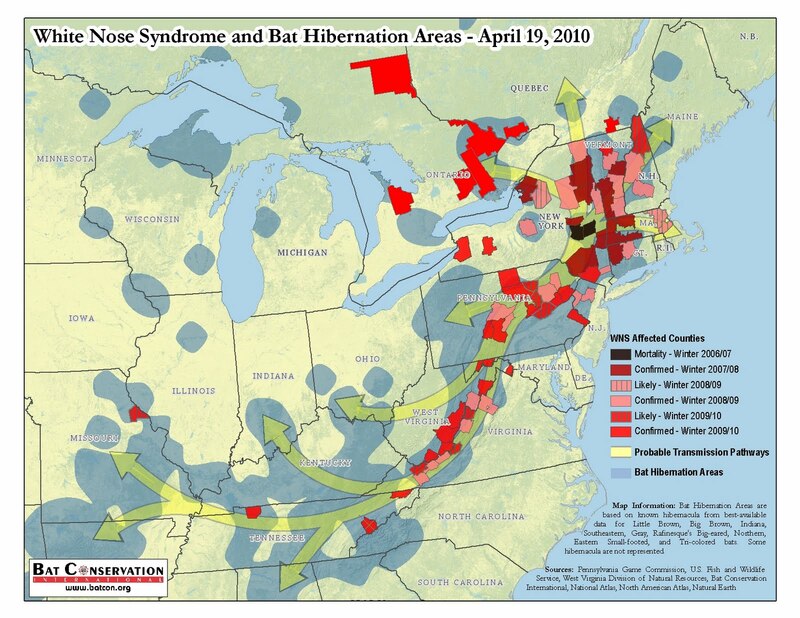 Within a year, White Nose Syndrome had spread to most of the known hibernacula in New York, and into Vermont and Massachusetts. Mortality of affected bats at these sites has been 90 – 97%, but it is not known how many, if any, survivors made it through the summer. Whether the fungus is the cause of a fatal disease or just an opportunist associated with an unidentified pathogen is also unknown. Afflicted bats exhibit radical behavior change, including increased winter activity. They often fly about the cave entrance, even leaving it to flutter about in broad daylight on a frigid winter day. Not surprisingly, necropsied bats have shown depleted fat stores. The disease could be directly responsible for this, or it could be the result of increased activity and inability to find food, or both. Is the activity caused by hunger or vice versa? It's possible that the pathogen interferes with the bats' ability to thermoregulate. In the winter of "06 -'07, an infected bat was taken into captivity, fed up, and released in spring, which suggests that it may be possible for bats to fight the infection if their condition is sufficiently raised. Some articles have blamed global warming, but there is no basis for this. Within the affected sites, all cave-hibernating species have been found to be affected, except the Big Brown Bat (Eptesicus fuscus) and the Eastern Small-footed Myotis (M. leibii). The latter species, listed by New York state as a species of special concern, hibernates in different sections of the hibernacula, and work is underway to establish if they are infected; it's assumed that they are. Some dead bats have been found without the fungus, and fungus has been collected from asymptomatic bats. Last year, G. destructans was found on an otherwise asymptomatic Greater Mouse-eared Bat (Myotis myotis) in France, suggesting that there may be more to WNS than a simple fungal infection. Preliminary findings suggest that immune functions of infected bats may be significantly impaired. Like Chytridiomycosis in frogs, White Nose Syndrome is a darkened room with far more questions than answers, and the potential of real ecological devastation. Disinfection and general behavioral guidelines (similar to the ones established in 2007 for Chytridiomycosis) are being hammered out for biologists and spelunkers. Nine universities and a number of state and federal wildlife and health agencies are involved in studying WNS, along with a number of independent researchers. The U.S. Fish & Wildlife Service's Indiana Bat Recovery Team is overseeing distribution of funds. lower: Spotted Bat (2007) acrylic on illustration board 20" x 30"